I thought it was time I scrolled through my Pinterest recipes and picked one for this blog. 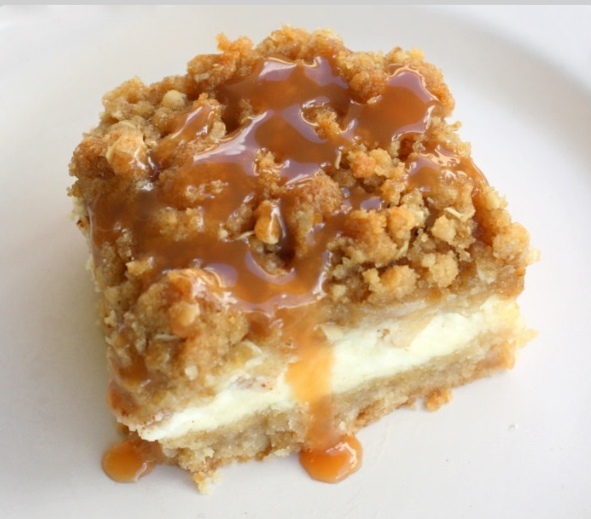 This is not an easy task as I have pinned so many recipes I didn’t know where to start …… soooo…… I swiped down the screen and then blindly hit a pin and wallah – Caramel Apple Cheesecake Bars! These are awesome, no beyond awesome, these are BE-AWESOME! 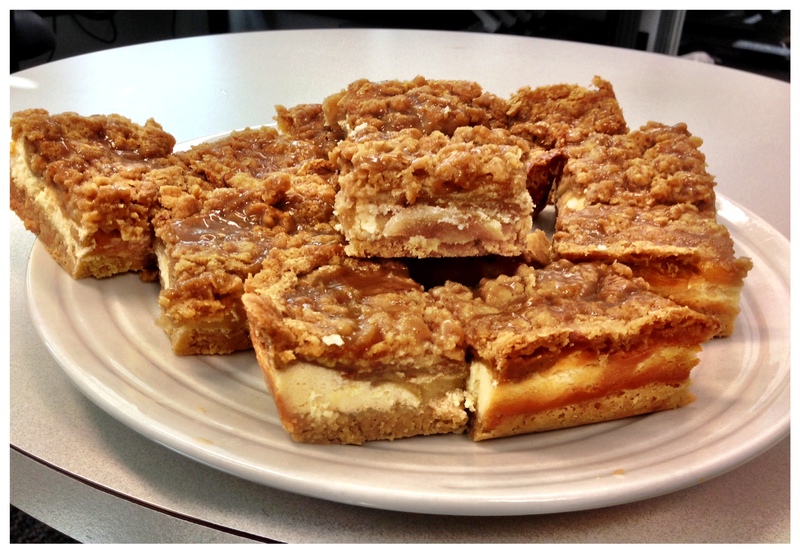 Easy to make and oh so gooey and caramel-ly and streusel-ly! I know that none of these words are accredited in the Oxford dictionary but hey it’s the best way to describe these delectable morsels of food. I can’t make you bake them but I encourage you to try them out – do yourself a favour; your kids will love you; amaze and astound your friends (yep I’m out of clichés but seriously bake and eat these – nuff said). Press evenly into a 9×13 baking pan lined with heavy-duty aluminum foil. Bake 15 minutes or until lightly browned. Sprinkle Streusel topping over apples. Bake 40-45 minutes, or until filling is set. Drizzle with caramel topping and let cool. Complexity Rating: – Sweet as! Yes apples again but, this one is like the best of apple crumble and custard combined into one glorious cake – simply brilliant! 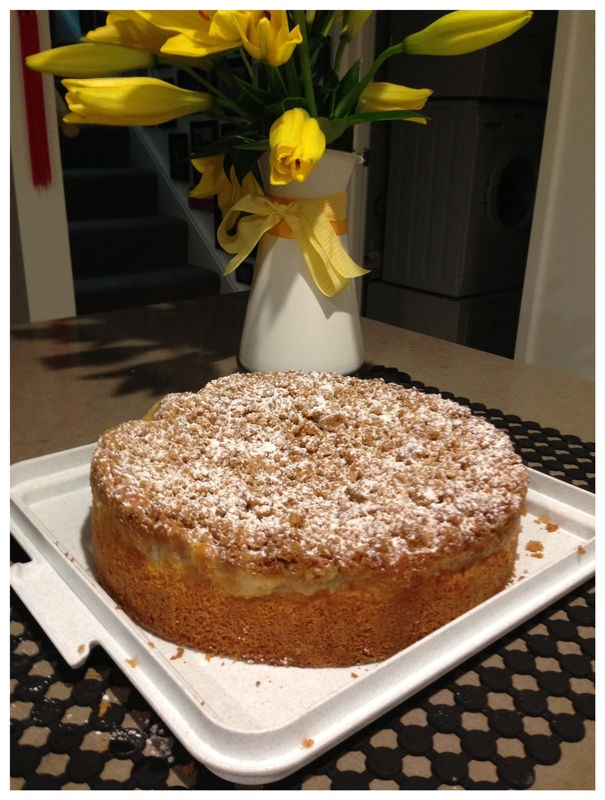 This recipe is from the Australian Women’s Weekly, May 2013 edition. This cake was a great surprise. The custard infuses into the cake and gives it an amazing silky texture and the crumble top gives you the sweet crunch with a hint of coconut. It is amazing served straight from the oven (well after the 10 minute cooling time) with a big dollop of double cream. I did cheat with this recipe. I was too lazy to brave the cold and buy more apples from the corner store so I used tin apples. It in no way affected the quality of the cake – well as far as I could tell. I also discovered that any leftovers will freeze very well just make sure you thaw it out slowly before eating – don’t give it a quick nuke in the microwave as it destroys the texture of the cake. I do have to reveal that I did want a slice of it for breakfast this morning when I awoke – is that wrong? Preheat oven to 170oC/150 oC fan forced. Grease and line a 23cm round springform pan. Lightly stew the apples by placing them in a saucepan with water, cover and simmer over low heat for about 10 minutes, or until just tender. Drain excess liquid, cool to room temperature. Crumble Top Place all ingredients into a food processor and process until the mixture resembles coarse breadcrumbs. Remove from processor and set aside in a bowl. Put eggs and sugar into a food processor and process for 2 minutes until light and creamy (Note: I used a mixer and it worked just as well). Add the softened butter and process until just combined (approx. another 2 minutes). Add flour, custard powder and milk to the egg mixture and process until just combined. Pour the cake mix into the cake pan and spread out evenly. Place the stewed (or tin) apples on top, making sure to cover all the cake mix. Sprinkle the crumble over the apple. Bake for approximately 1 hour or until a skewer comes out clean. Stand cake for 10 minutes before removing from the pan. Tips: This is suitable to freeze (especially if you don’t want to share). Complexity Rating: – Simple dimples! Winter 2013 was an apple season for me. 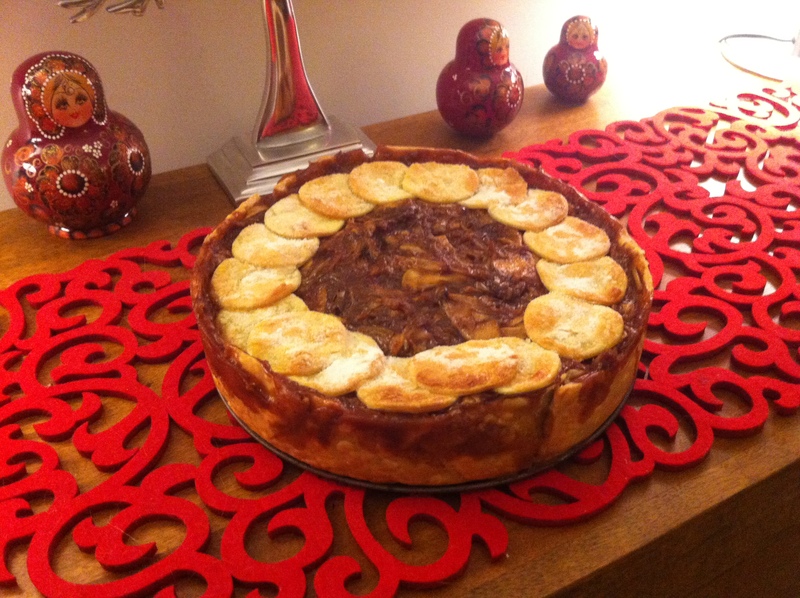 I had a bit of an obsession with apples and wanted to cook something other than plain old apple pie (not that there is anything wrong with the classic apple pie, none whatsoever! ), so I tried this one from the Coles Supermarket Magazine. I’m not sure what year this was published as the torn page didn’t have the date on it. This was just beautiful! Do you notice the butterscotch sauce dripping gloriously down the sides? It was lovely and caramelised with syrupy sweet apples and a pie crust that hugged the filling like your grandma would. I decided not to cover the entire top of the pie with pastry circles as I wanted my guests to see the glorious apple stuffing (and I secretly hoped it would increase anticipation levels). Most of my guests had seconds and some even thirds and I served it straight from the oven with a choice of vanilla ice cream or double cream. Nanna’s around the world would have been proud! Grease a 20cm springform pan. Cut 1 sheet of pastry into 4 strips, lengthways. Place a strip along each edge of second pastry sheet, pressing lightly to join to make one large square. Ease prepared pastry into pan, pressing into base. Trim edges. Prick pastry with fork and chill for 30 mins. Meanwhile, place brown sugar, syrup and butter in a large saucepan. Stir on low until melted and smooth. Simmer for 2 mins. Place flour and spices in a large bowl. Add apple, toss to coat. Add to syrup. Stir to coat. Simmer for 20 mins stirring occasionally until apples are just tender. Preheat oven to 180 °C or 160 °C fan forced. Line shell with non-stick baking paper. Fill with rice. Blind bake for 15 mins. Remove rice and paper, bake for 5 mins. Spoon apples into pastry shell. Using a 4cm round cutter, cut about 30 rounds from remaining pastry. Starting from the outside edge of the pie, arrange rounds, overlapping slightly over apple filling. Brush pastry lightly with beaten egg and sprinkle over caster sugar. Bake for 30-40 mins until golden and crisp. Serve apple pie in wedges with ice cream. Complexity Rating: – Definitely do-able. Not only does this cake look good but it tastes good. The cake is moist, buttery and fluffy and the icing is not too sweet and balances the crumble of the cake exceptionally well. Warn your friends and family that the icing will make their tongue turn silvery purple but according to the fashion industry this is the new black! You’ll need a 30cm x 40cm cake board, and two 30cm pieces long thin wire (22 gauge). For the cake you will need 2 x 22cm round cake tins, 7cm deep. Preheat oven to 180°C/160°C fan-forced. Grease two 7cm-deep, 22cm (base) round cake pans. Line bases and sides with baking paper.Make packet cakes following packet directions or homemade cakes (see recipe below). Divide batter between prepared pans. Bake for 40 to 45 minutes or until cooked through. Stand in pans for 5 minutes. Turn out onto a wire rack to cool completely. Make icing: Using an electric mixer, beat butter in a bowl until pale. Gradually add icing sugar mixture and milk, beating constantly until combined.Tint icing violet with food colouring. Spread 1 cake with 1/2 cup icing. Top with remaining cake. Cut one-third from cake. Place cake, cut-side down, on board (it should sit up on the cut base). Spread top and sides of cake with remaining icing and dust with silver edible liquid colour. Using picture as a guide, place medium white flowers around base of cake. Thread 1 piece of wire into large pieces of soft liquorice and push together. Bend to create handle. Wrap each end of wire with sticky tape to enclose. Insert into cake top. Tear 4 x 15cm strips from liquroice strap to make a tassle. Fold each strip in half and secure with a piece of wire gauge 1 cm down from the fold. Leave a 3 cm length at one end of the wire so you can push it into the cake near the base of the handle. Wrap end of wire with sticky tape prior to placing in the cake. Using my picture as a guide, decorate cake with liquorice strips torn from liquorice 2 metre straps and silver circular cachous. 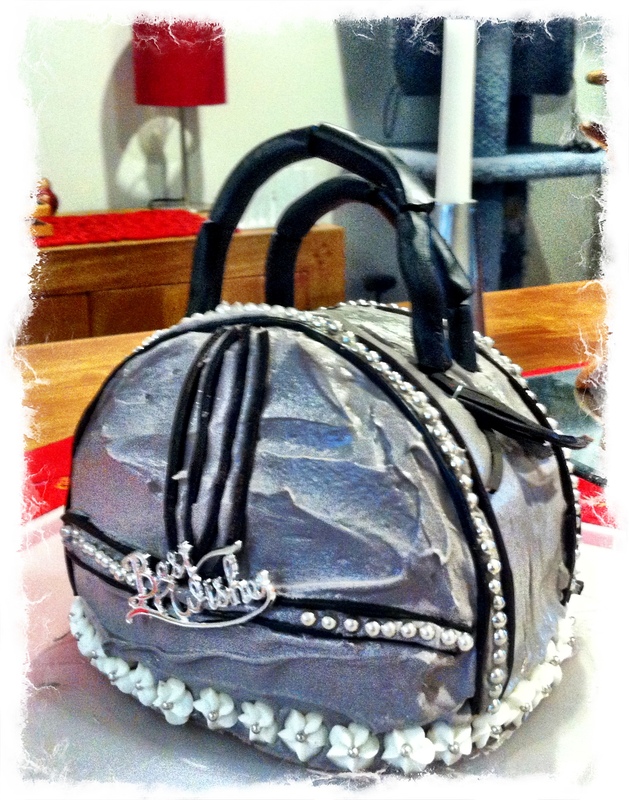 I placed a Best Wishes cake decoration on one side of my cake to replicate the bag brand. Serve. Complexity Rating: – This is worthy of a scout achievement badge! 1 x 22cm round cake tin, 7cm deep. Using an electric mixer, beat butter, vanilla and sugar until light and fluffy. Add eggs, 1 at a time, beating after each addition. Stir in flour and milk until combined.Spread into prepared pan. When they talk about food from heaven, this must surely be what they are talking about. If I was marooned on a desert island and could take one food item with me this would be it! This recipe was given to me by my wonderful hairdresser Fe Warbuton (Hi Fe!) back in 2012. She told me that her husband, Alex, is not a dessert person but this cake quickly converted him. This recipe challenges the conventions of baking – who puts a cake in the freezer once it is cooked? Well you will when you make this amazing banana cake. 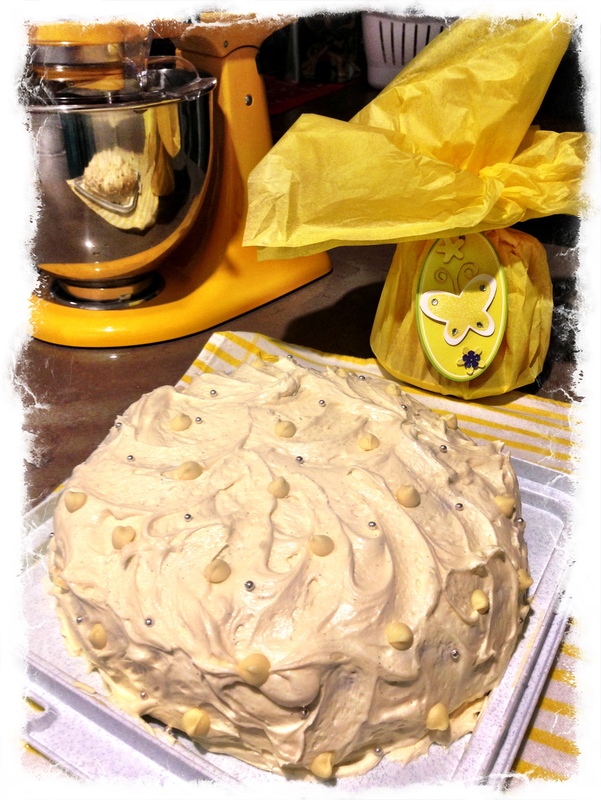 It uses the best ingredients of cake making; brown sugar, butter, eggs, flour and vanilla bean paste but demands you freeze the cake straight from the oven and before you ice it. Your patience will be rewarded with the most deliciously moist, fudgy and more-ish banana cake imaginable. Fe did indicate in her recipe to use low-fat cream cheese and rice bran oil instead of butter but come on, this is not a cake that deserves low-fat anything! I used the full fat version of everything and it was the best decision I could have made. I am sure you can tell by my description of this recipe that it is well worth your effort. Preheat the oven to very low, 135oC. Make room in your freezer to accommodate the hot cake pan, moving all your precious frozen food to another space in the freezer in anticipation. Grease and line a 22cm round spring form cake pan. In a medium bowl, sift flour, baking soda and salt together. Set aside. In a stand mixer or large bowl, cream the butter and brown sugar until light and fluffy. Beat in the eggs one at a time, then stir in the vanilla bean paste. Beat in the flour mixture alternately with the buttermilk, being careful not to over mix. Stir in the mashed banana. Pour batter into prepared cake pan. Bake in preheated oven for 1 hour, or until a toothpick inserted into the centre of the cake comes out clean. Remove the hot cake from the oven and place it, pan and all, directly into the freezer for 45 minutes (I placed mine on a chopping board so it would damage my freezer drawer). In a large bowl, cream butter and cream cheese until smooth. Beat in vanilla bean paste. Add icing sugar and beat on low speed until combined, then on high until icing is whipped into a fluffy smooth cloud. Spread on cooled cake, swirling into attractive peaks and then down the sides. You can decorate it with gold leaf, crystallised violets or whatever takes your fancy. Chill in the fridge for half an hour. Slice and serve, and as Fe would say, prepare to swoon. Complexity Rating: – Time is required. 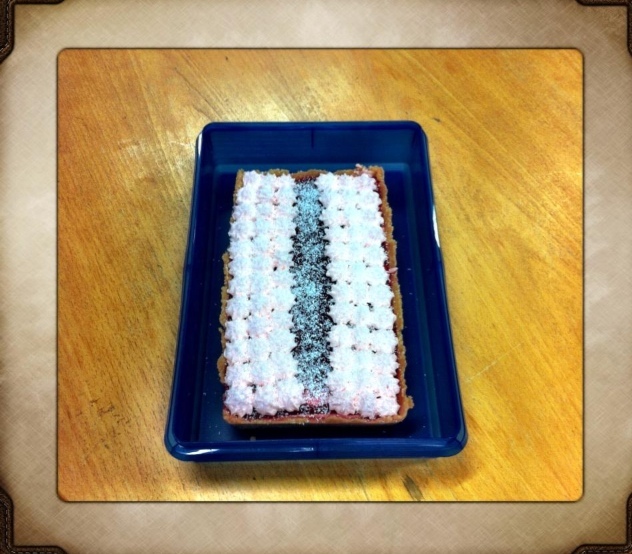 This interpretation of an Arnott’s Iced Vovo biscuit is from Good Taste Magazine, January 2013. I chose this one because it was on the cover and looked amazing and I thought………..I can do that! A no bake tart that can be made up to two days ahead – just store in the fridge and decorate before you serve. Sounds like the perfect thing for my rostered work morning tea duty. This recipe requires some time to produce but the layers are not difficult to make or put together. I started the recipe on a Tuesday night, completing the first two layers, then finished it on Wednesday night with the jelly layer and cream rosette topping. I found this tart a bit sweet but everyone at the office thought it was amazing and I have received many requests to make it again. I did however love the combination of layers: sweet gooey marshmallow, a sharp woobly jelly and soft dewy cream and coconut. This is probably something you could make with the kids. Note: If you can’t buy Iced Vovo’s in your country make the base with 250g of plain sweet biscuits and omit the Iced Vovo requirement. To make the base, spray a 35 x 11cm (base measurement) fluted tart tin, with removable base with canola oil. In a food processor, blitz combined biscuits until finely crushed. Add butter. Process to combine. Use a glass to spread ad press mixture firmly over base ad sides of prepared tin. Place in the fridge for 1 hour. To make marshmallow filling, stir marshmallows and milk in a saucepan over medium-low heat for about 3 minutes or until the marshmallows melt and the mixture is smooth. Transfer to a bowl. Stir in food colouring, for about 6 minute to cool. Use an electric beater to beat cream and vanilla bean paste in a bowl until firm peaks form. Gently fold half the cream mixture into the marshmallow. Fold in the remaining cream until combined. Spoon over the biscuit base and smooth the surface. Place in the fridge for 2 hours or until firm. Meanwhile, to make the raspberry jelly, place gelatine leaves in a bowl and cover with cold water. Set aside for 6 minutes to soften. Stir the raspberries, water and sugar in a saucepan over medium-low heat for 1 minute or until sugar dissolves. Bring to a simmer. Cook, stirring occasionally, for 2-3 minutes or until raspberries collapse. Squeeze excess liquid from gelatine leaves and add to raspberry mixture. Stir until gelatine dissolves. Strain mixture through a sieve into a bowl. Discard the seeds. Set aside, stirring occasionally, for 25 minutes to cool. Carefully pour the jelly over marshmallow. Place in fridge for 2 hours to set. To make topping, use an electric beater to beat the cream in a bowl until firm peaks form. Stir in food colouring. Spoon into a piping bag fitted with a 1cm fluted nozzle. Pipe rosettes in 2 rows along the 2 long sides of the tart. This baking delight was found in a NSW Sunday Paper from 2009 in which Donna Hay published a selection of recipes from her new cookbook. I chose this one out of the eight featured because the article claimed it was fool-proof, easy and tasty – it proved to be all of these things as promised. It was extremely simple to make; all the ingredients are thrown into a bowl, mixed and then poured into the baking tin. I made two amendments to the recipe: I added 1/4 – 1/2 cup of chopped maple pecans to the mix and sprinkled 2-3 tablespoons of brown sugar over the top of the mix before placing the tin in the oven to bake. 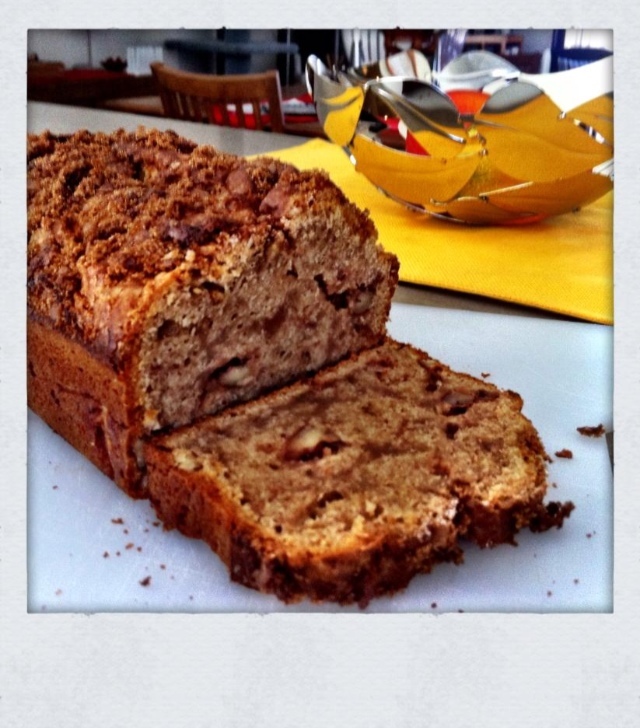 The banana bread is moist and full of flavour. It can be eaten on its own or with a little bit of butter (well let’s be honest, a lot of luscious butter). The maple pecans add a great texture and the brown sugar adds a caramel sweetness to this amazing treat. Serve with your favourite hot beverage or alone as an afternoon snack. It freezes well but I would recommend you slice and wrap each piece separately before freezing. Preheat oven to 160oC (325oF). Place the mashed bananas in a medium bowl and add the oil, eggs, sugar and vanilla and whisk to combine (add chopped maple pecans if using). Add the sifted flour and cinnamon and mix to combine. Pour into a lightly greased 25cm x 11cm loaf pan lined with non-stick baking paper. Sprinkle with 2-3 tablespoons of brown sugar (optional) before you bake for 1 hour and 10 minutes or until a skewer inserted comes out clean. Allow to cool for 5 minutes, before turning out onto a wire rack to cool completely. Complexity Rating: – Easy peasy!